It is official you now do not need to go to our Montana Ave Store or Truckie to get your Frozen Fruit Co fix. 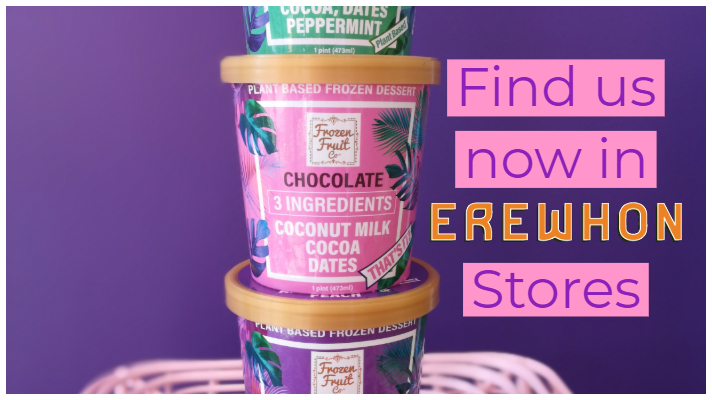 That’s because we have now launched our range of grocery pints into all of Erewhon’s LA locations – Venice, Calabasas, West Hollywood and Santa Monica. We have launched with three of our most popular flavors Chocolate, Chocolate Mint and Passion Fruit (sorry, no Salted Chocolate…yet). We pride ourselves on making our plant based “ice cream” from short and natural ingredient lists and most importantly NEVER compromising on flavor, taste or texture. That’s why on our grocery pints we list the ingredients on the front of the packaging (something no-one else in the ice cream freezer does). The idea for grocery pints came in November 2018. People kept suggesting the idea, but we just weren’t sure – “how would we make the pints?,” “Where would we sell them?”, “Can we make them?”, “How can we get the labels?”, “How do you even get a bar code?”. With Christmas being our quiet period we had the time to investigate. The hardest part…was actually the labels. We spent a lot of time just working out how to get a label on a tub that was the right size (we even stick them ourselves…a new skill we never knew we had). Five months later and here we are in grocery stores. Sometimes you just have to go one small step at a time and eventually amazing things can happen. We couldn’t have done any of this without the support of everyone so thank you. Now, please go to Erewhon and buy some pints (…no seriously – please).